Lake Powell, and an increasingly familiar bathtub ring. 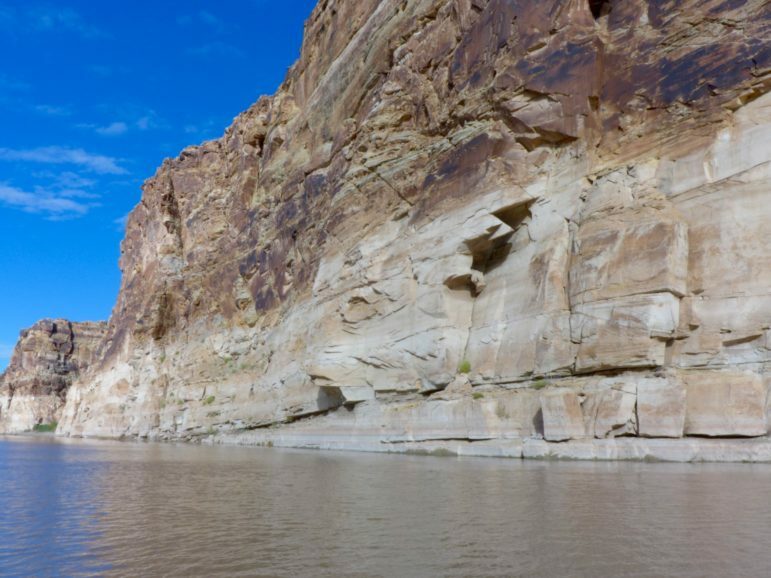 SANTA FE — A four-year pilot program that paid ranchers and farmers in Colorado, Utah, Wyoming and New Mexico about $200 per acre-foot of water saved by fallowing fields in order boost water levels in Lake Powell will be put on hold after 2018. “Although the pilot (program) has helped explore the feasibility of some aspect of demand management programs, it does not provide a means for the upper division states to account, store and release conserved water in a way which will help assure full compliance with the Colorado River Compact in times of drought,” the resolution said. 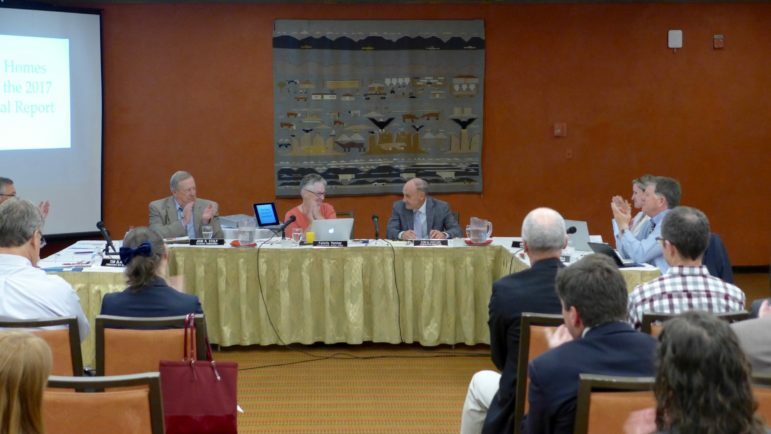 The Upper Colorado River Commission, meeting in Santa Fe on June 20, 2018. Don Ostler, seated third from left, gets a round of applause as the outgoing executive director of the Commission, which helps manages the upper Colorado River system for Colorado, Utah, New Mexico and Wyoming. Ostler is leaving after 14 years and being replaced by Amy Haas of New Mexico, who currently serves as general counsel to the commission. The pilot program “does not allow the upper division states to sufficiently investigate storage or the additional administrative, technical, operational, economic and legal considerations necessary to explore the feasibility of demand management as part of its ongoing emergency drought contingency planning efforts,” the resolution adopted by the commission states. 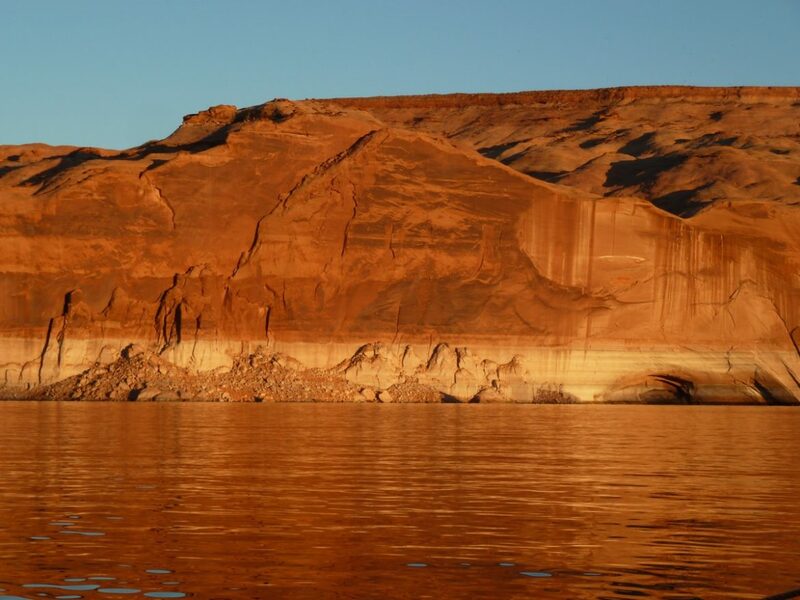 The now familiar bathtub ring in Lake Powell, shown here in 2016, is evidence of falling water levels in the big reservoir, which can hold 24.3 million acre-feet of water but today is about half-full.